Producing more and more content is an issue for all of us online. We need to constantly update our websites and provide fresh and new things for people to look at and for Google to take notice of us. However, it can seem like a never-ending treadmill that you are on; constantly having to run faster and faster just to keep up with everyone else. For big companies the solution is found in hiring more people. Companies that never before had writers or video producers in the building now have entire floors filled with content producers. Content teams are springing up in corporates all across the world. However, for smaller firms and for the self-employed this is not an option. The alternative is to outsource to freelance writers – but the results can be variable. That means for many companies content production is down to the people in the company, already hard-pressed with other work they need to get on with. Consequently, they do not produce as much content as they need or want. The answer is staring them in the face, though. They already have content than can use and re-use in different ways. When you look at a newspaper you see different stories every day. But underneath those thousands of stories that we read, there are only a relatively small number of actual stories; they just get reformatted and reused in a variety of different ways. There is the “mystery surrounds” story or the “major row is brewing over” story, for instance. All they really need to do is fill in the blanks. Producing completely original content is actually unusual in the extreme. 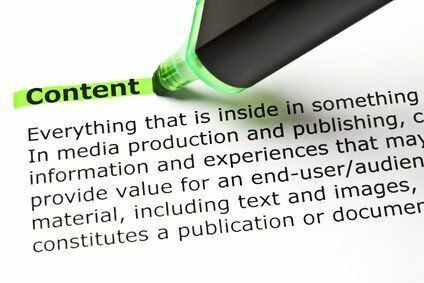 Producing useful content in the format that your visitors want is what you need to concentrate on. And that means you can reuse old content in several different ways. Here is an example. The other day I wrote a post about Google wasting your time. But I converted that post into a slide deck on PowerPoint and put that on to SlideShare. I also embedded that slide presentation in my “multimedia” section. Not only that, I then converted the PowerPoint presentation into a movie, scrolling through the slides one at a time, and put that video onto YouTube. So, all I had to do is come up with one piece of content and then just re-use it in two different ways. It also means that the content is available in the formats different people prefer and in places they may look for it. For instance, some people prefer to click through slides and read them, rather than read 500 words of text in article form. Others won’t know about my blog post, but will search on YouTube for information, where they will find the same content. Of course, I could also produce the same content as a podcast. Hey presto…here that is as well. This took just five minutes to record and upload to SoundCloud. The slide presentation and the video created from it for YouTube, took about 15 minutes. So, in the space of 20 minutes I have created three “new” pieces of content, available in three different, highly popular, online locations providing my content in the form that people want. You too can do the same. Take a blog post, convert it to a slide show, make a movie from it and record a short audio summary of it. Far from not having enough content, you have far more than you imagined.